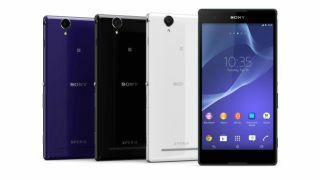 MWC 2014 may be just around the corner, but Sony is too eager to wait that long with the announcement of two new handsets – the Sony Xperia T2 Ultra the Xperia E1. The T2 Ultra is aiming itself at emerging markets, with no confirmed UK, US or Australia release date just yet. But that doesn't mean it's lacking in power, by any means. Arriving in an Xperia Z-like style, the T2 Ultra's 6-inch 720p display eats into the bezel, coming in within 2.5mm of the phone's edge. Powering the phone is a 1.4GHz quad-core Snapdragon processor with 1GB of RAM, 8GB of storage, and you'll find a 13MP camera sat on the back and 1.1MP snapper stuck to the front. Despite its Z-ish looks, the T2 Ultra doesn't share its water resistance. But as a phone for the emerging markets, it's not shoddy at all. Speaking of which, the phone also comes in the T2 Ultra Dual form, which (as you might have guessed) adds the option of dual SIM. Getting even more budget is the Xperia E1, which Sony is aiming at the music lovers with its 100db speaker. Sony's also upped the Xperia E's 3.2-inch screen to 4 inches, with a 480 x 800 resolution. You'll also get a 1.2GHz dual-core processor with 512MB of RAM and 4GB of storage. Again, this will be primarily aimed at emerging markets. Sony told us it had nothing to announce on release dates outside of those, but we expect we might hear more of the specfics at MWC. What do we make of the Sony Xperia Z1 Compact?